I take it as an extreme compliment when I am asked to review a book. And being a writer myself, I approach each book with a critical eye. I know the discipline it takes to finish a novel (having done so myself) and the heart and passion that each author puts into their work. 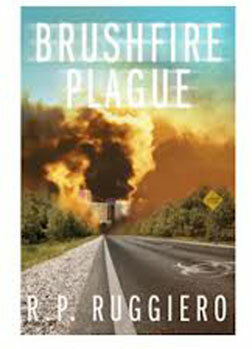 So it is my pleasure to recommend Brushfire Plague by R.P. Ruggiero. Frankly, this book is a refreshing departure from the spate of "survivalist" books on the market. Don't get me wrong, I applaud and encourage all the new novelists who have taken up the cause of Liberty and the protection of American values. We need all the books we can get to spread the word among our uninformed countrymen. Authors such as James Rawles, Matthew Bracken and William Forstchen have set the bar high. Through their exceptional books we have explored what will happen to our country in the event of a breakdown of our republican-style government, foreign troops on U.S. soil, and the devastation of an EMP attack. With Brushfire Plague, we examine what would happen when a deadly virus sweeps the land. The book is written in a very engaging style, drawing us into the relationship between our hero Cooper Adams and his young son, Jake. A devastating plague has swept the globe and Cooper swings into action, determined to save his family, his neighborhood and his country. The plot is conceivable, and the characters are credible. Mr. Ruggiero captures both the flaws and perfection of our human nature. Just imagine a plague sweeping the globe and how it would quickly reveal the best and the worst of society. While reading the story, I could easily see how this scenario would play out in my own community and among my connections. You will recognize those who become the natural leaders, and those whose egos must be stroked to maintain harmony. You will identify the skills that will be necessary and those who are capable of implementing them. There will be "takers" and there will be "givers". The interplay between characters is natural and logical; neither false nor forced. In short, it is a well-written story. But it is more than that. I believe it is a plausible situation. The whole time I was reading it, I couldn't help thinking, "This is going to happen." So I am especially appreciative of the preparations and instruction that the author so deftly works into his plot. Hidden in the midst of the gripping story of survival amid fast-spreading illness, societal decay, and violence are many suggestions for how to prepare and protect your family and your neighborhood. If you have friends and family that need a wake-up call, this book will open their eyes. It's all there --- how to organize your neighbors; how to defend against looters and organized gangs; how to combat a government who exploits the situation; and how to just survive day-to-day. If you are a dedicated survivalist, you know all the steps to take. But this book presents a well-reasoned timeline with which you can compare your plans. And we even get a look at how the Bill Gates/Eugenisist movement might instigate their plan to de-populate the world. Believe it or not, it is in their plans and what better way than to develop a virus? Brushfire Plague examines how, and if, the world could recover from such a diabolical plot. The book is available through Amazon or PrepperPress. It was a thoroughly enjoyable read, although I must admit, as a writer, that the occasional typo, or words left out, make me flinch. But in this new genre of "survival" and "prepper" books, it is a foible that I can overlook. These books are providing a valuable service to those who are willing to take advantage of what they have to offer. And what better way to take our medicine than in an absorbing, riveting story? I can't wait for the sequel! P.S. The book is available both in Paperback and on Nook at Barnes & Noble. Get it anyway you can! Psalm 107:2 "Let the redeemed of the Lord tell their story— those he redeemed from the hand of the foe ...."
I just finished reading the book The Cobra Event. It deals with a terrorist pandemic and just recently the movie Contagion was on TV. I have to admit I've never given much thought to this subject. The speed that a virus can spread is very scary. Yours is the 3rd review I have seen for the Brushfire Plague. I'm going to order my copy today. JM, I'll have to check out The Cobra Event. Thanks for the suggestion. A deadly pandemic is a sobering thought. And those living in crowded cities will be extra vulnerable. Vigilance will not be enough. God help us! I would also recommend David Crawford's "Lights Out." It's an EMP catastrophe book, but not nearly so predictable as Scott Crawford's "The Pulse." I honestly liked "Lights Out" more than Forchten's "One Second After" because I thought the story flowed better. Crawford's book is longer than most, and it does a good job telling the story of how a community comes together in a true American (and, truthfully, Texan) spirit. I couldn't decide if Crawford was shooting for the young-adult crowd or not. I've only read one other disease-related SHTF book, and that was "The Jakarta Pandemic." It was OK, but I was left with a few too many "really??!!??" reactions to some of the situations in that one. Of course, I'm certain that many of my reactions aren't going to necessarily follow others'. Yes, "Light's Out" is one of my husband's favorite books, because it really captures the sense of how important community is going to be. While Brushfire Plague has its flaws, it errs on the side of a good, captivating story with helpful information and a good dose of reality. It's a quick read and leaves me wanting more, although the ending was rather abrupt. But I have no hesitancy in recommending it. It's definitely a keeper! Will do. I'll be getting it. PLW is a brilliant man to like "Lights Out." I'm reading the New World series by John O'Brien. I'm on the 5th book now. There are multiple items I'd like to take him to task for...but NOW he introduces submarines coming back from sea/operations. So I'm hooked. If you want to read an interesting, developing story, I'd recommend "Ruth's Story" under the http://allensrepositoryofstuff.com/ link. This is a zombie apocalypse story that I like. Allen takes some good inputs from his readers as he develops his story and has a good description of how gear works in the field. Oh, and his sister married a submariner...what's not more to be said to pump him up??? If/when I get more time, my dream is to do an on-line survival story of submariners who come back to port...but O'Brien and Allen may have already beaten me to it (with some input from a devious jinn). All the best to you and PLW. No amount of freeze dried/dehydrated/instant peanut butter will EVER compare to so PF Chang's and good company. PS #1 daughter is really grooving on the western artwork from PLW. You have another fan on a whole different level! Thanks for the reading suggestions. We are always looking for new material that captures our imagination, while staying true to reality. We'll be checking out both O'Brien and Allen. And I think we will be needing to add more bookshelves to our library! Glad your daughter likes the art. It's always fun to introduce someone new to PLW's art; especially those that appreciate talent. See you next time you're in town!